With apologies to Allan Sherman’s 1963 parody that complains about the terrible conditions at a fictional Camp Grenada, the following upbeat letters sent home by our contributor’s younger self recall his joyful stay at Camp Lenape, a Boy Scout camp. Mosquitoes, merit badges, a menu of bug juice and burgers, plus a canoe trip along the Wading River from Chatsworth to Chip’s Folly had the makings of an unforgettable week-long wilderness adventure in 1956 at the camp once in the Pinelands of Medford Township, Burlington County, New Jersey. What may sound like indentured servitude to us today was one 13-year-old boy’s relentless pursuit of merit badges to advance rank in scouting. …finally we succeeded in getting the tent up… we were soaked to the skin. At this point it was pitch dark and the rain ceased. The we ate supper, hamburgers, salad, bug juice, and oranges. We hardly slept a wink because of the singing of the mosquitos. …today we packed all our duffle, ate breakfast, and had a small morning worship service… breakfast was Rice Krispies, orange juice, bacon, coco and scrambled eggs. …we made it. We had canoed for close to 9-1/2 hours. …Only about 40 boys in camp this week… Richard and me are going to try and get as many merit badges as possible. Just got back from washing dishes for cooking merit badge… For our supper tonight we had chocolate pudding, coco, veal cutlet, diced carrots, homemade bread, and broth… For Cooking merit badge I have already made a fireplace and cook meals and build fire. For Pioneering merit badge I have been working on [a] 100 foot bridge across Great Earth Dam… learn how to splice, lash, etc. Such was a scout’s summer adventure before housing development in the late 1980s swallowed up Medford’s 419-acre Camp Lenape, which once served thousands of Burlington County Boy Scouts. Many in this area anxiously held their collective breath last November when news services broadcast the distressing reports that a two-alarm fire had struck their cherished Moorestown Community House. For those at a distance, you can catch up on old news with these links, or go to the MCH Facebook page for many updates on the building’s recovery. As news spread of the fire, many folks immediately referenced memories and personal milestone events connected with their beloved Moorestown landmark. By Harlan B. Radford Jr. In April of 1954, when I was just 11 years old and in the fifth grade, our family moved from Cinnaminson to a new home on South Washington Avenue in Moorestown. Little did I know at the time that the stately brick and stone Moorestown Community House would soon become my “second home.” That treasured community facility has served not only the needs of my family, but also those of countless others for some 90 years! 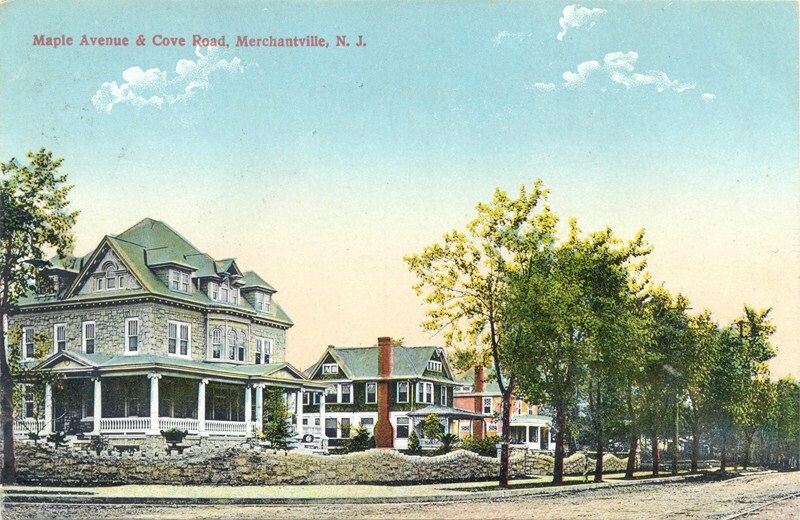 The following vintage post cards and photographs confirm just how intertwined the place known as “The warm and friendly heart of Moorestown” was in my life. 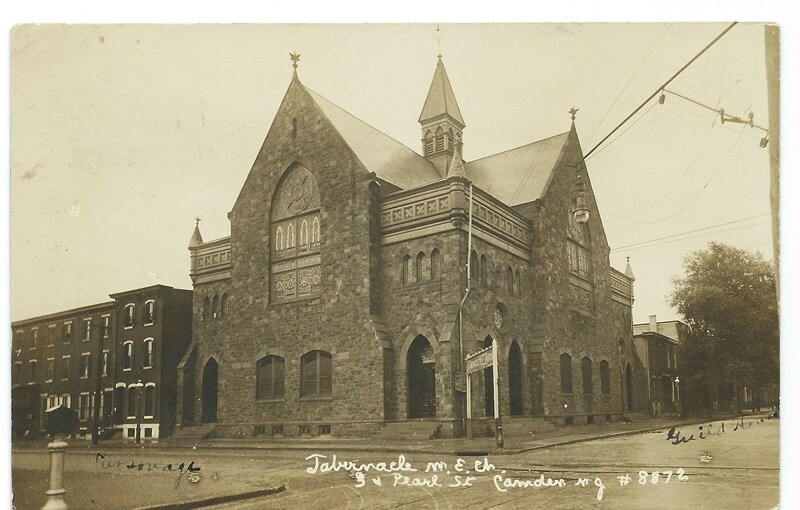 In 1923, Eldridge Reeves Johnson, the highly successful founder of the Victor Talking Machine Company donated the money to build a community center on a centrally located three-acre parcel of land now known as 16 East Main Street in Moorestown. “The Towers,” Johnson’s Main Street Moorestown home, was originally the home of another renowned Moorestown resident, Samuel Allen, the inventor of the Flexible Flyer sled. It is now the Lutheran Home. The Moorestown Community House website provides a detailed history of the founding and development of the institution. The express purpose of this community center was be to provide a “home” to meet the civic, social and recreational needs of individuals, families and organizations. The Moorestown Community House officially opened its doors to the public on April 11, 1926. Various remodel efforts improved handicapped accessibility and converted space for new purposes. Currently, the independent 501(c) 3 non-profit is engaged in a fundraising campaign to raise $2 million that will be used to update and maintain its historic building. Various chronologically arranged images related to the Moorestown Community House follow with dates, where available. The first eleven images range from 1928 to the latter 1940s. Scroll down for the photo gallery. Click on images for larger views. 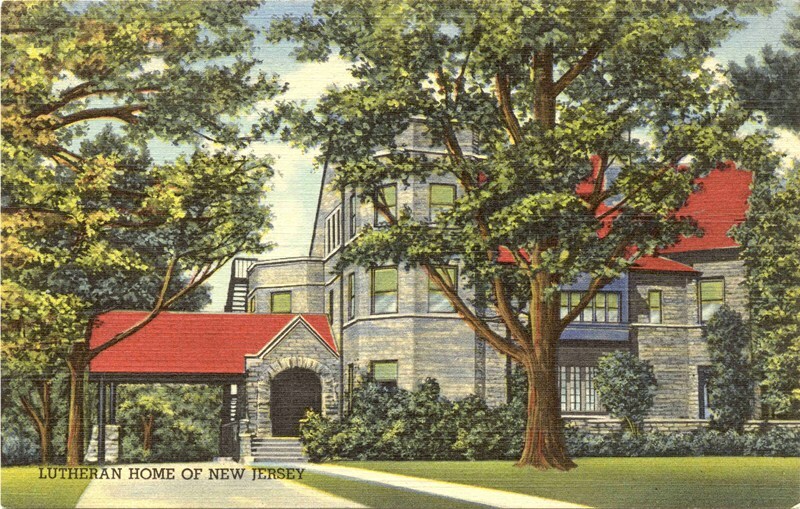 Figure 1: a piece of writing stationery features a circa 1928 view of the Moorestown Community House. Figure 2: a RPPC, or real photo post card, mailed and postmarked APR 18, 1931. Figure 4: a hand-colored item shows the beautifully tended gardens located in the rear of the Community House. Figure 5: a monotone image of the same garden view shown in the previous post card. Figure 6: a RPPC bearing a postmark dated APR 22, 1940. Figure 7: another view in black and white. 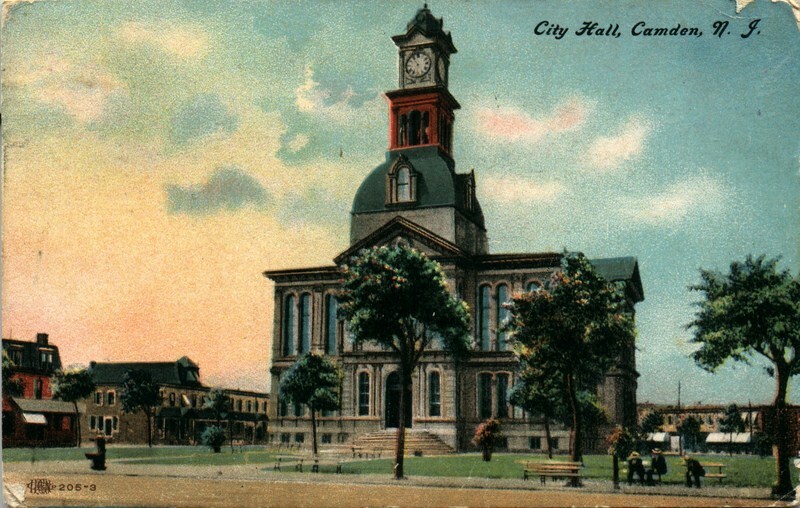 Figure 8: a hand-colored postcard, not postally used. Figure 9: shows a JUL 16, 1948 postmark. Figure 10: interior view of the “gymnasium set for luncheon,” printed in France. Note the elevated tiers, or balconies, on both sides of the gym for spectator viewing of basketball games, and the raised stage with curtains and piano. 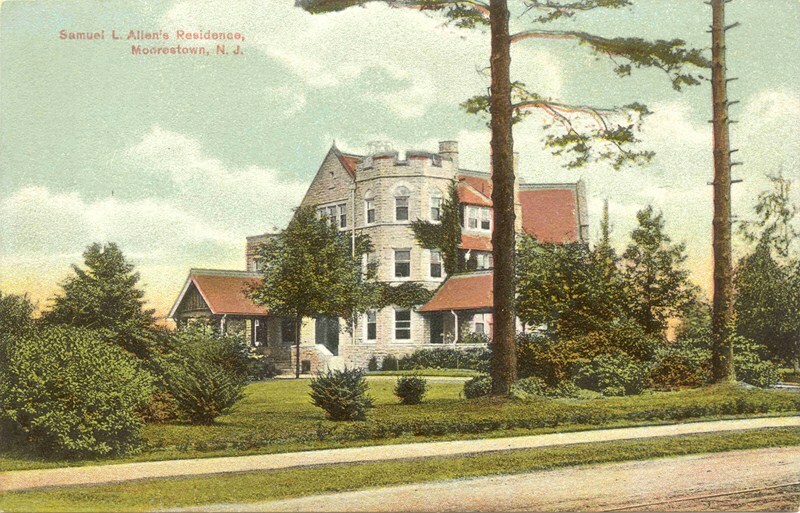 Figure 11: a post card, also produced in France, shows an interior view of “the corner of the woman’s club” located in the front northeast corner of the Moorestown Community House. From the mid-1950s to 1961, the Community House became a very important part of my junior and senior high school years. Frequently, my classmates and I after school would go to the public library at the Community House to study. I vividly remember the centrally located circulation desk, the extensive Dewey Decimal call numbered card catalog with its multitude of drawers, numerous tables and chairs on the first floor, and a smaller upper section with some comfy easy chairs for reading. Books were accessible on both levels and all I can say is they just don’t build such quaint libraries like that anymore! Unfortunately, I have never seen any post card views of the inside of the Community House Library. The countless hours I spent swimming at the Community House pool during the 1950s are deeply etched in my memory banks. Many a time I would go to the Community House swimming pool to swim on Friday evenings from 7-pm and Saturday afternoons from 2-pm. Upon entering Moorestown High School, I became a member of the boys’ swimming team, and for the next four years from 1957 to 1961, all our practice sessions as well as all our home swimming meets took place at the Community House pool. The 20-yard pool featured a one-meter diving board and consisted of four very narrow lanes. There were no starting blocks at that time and I do not recall anyone ever wearing swim goggles. How we ever managed to swim so much without the aid of swim goggles is beyond me! However, nose clips were available, generally used by the backstroke swimmers. We conducted our practices with kick-boards, or flutter-boards. I distinctly remember how very choppy the water was when we conducted our practices or when swim meets were held. What a contrast to competitive swimming today! What exciting times we had competing with the teams in our South Jersey Swimming League including Merchantville, Delaware Township, Haddon Heights, Woodrow Wilson, and Camden Vocational. Both the boys’ and the girls’ swim practices and home swim meets were held at separate times at the Community House pool. All in all, the Community House pool particularly got a great deal of use during swim season between the months of November and early March. It took a great deal of planning, scheduling, and coordination to make these two programs possible and so successful. We Moorestonians were extremely fortunate to have our own town swimming pool as very few high schools in our area at that time had such facilities. Figure 12: a posed press photograph taken in 1960 shows Bea and Albert Thomas, Moorestown High School’s girls and boys swim coaches, flanked by some team members along the sides of the Community House pool. Figure 13: another posed press photo taken at the Moorestown Community House swimming pool shows three members in starting positions, including me, from the 1960 swim team. Figure 14: the entire 1959-1960 Moorestown High School Boys’ Swim Team proudly displays some recently won and prestigious hardware at the MCH Pool. Team co-captains Harlan Radford and Donald Munson hold the trophy won during the 28th Annual New Jersey State Swimming Championships (Class B) held at Princeton University in March 1960. A proud moment, to say the least! Figure 15: the end of the 1960-1961 season finds the boys’ swim team at the Community House showing off more hardware including 3 new trophies for the high school’s trophy cabinet. Seniors and co-captains Harlan Radford and Bill Brady hold the team’s second consecutive New Jersey State Swimming (29th Annual) Championship Trophy (Class B), which was won at Princeton’s Dillon Pool on March 4, 1961. Such honors attest to the ongoing strength and depth of the Moorestown High School Boys’ Swimming Program at that time. From 1959 into 1961, I worked at the Community House Pool as a Certified Red Cross Life Guard and spent many hours life guarding at the public swim sessions. When I worked five hours at $2.00 an hour in a weekend, I earned $10.00 – very generous pay for a high schooler back at that time. For that opportunity, I was most appreciative. Clearly, the Moorestown Community House was important to me growing up. 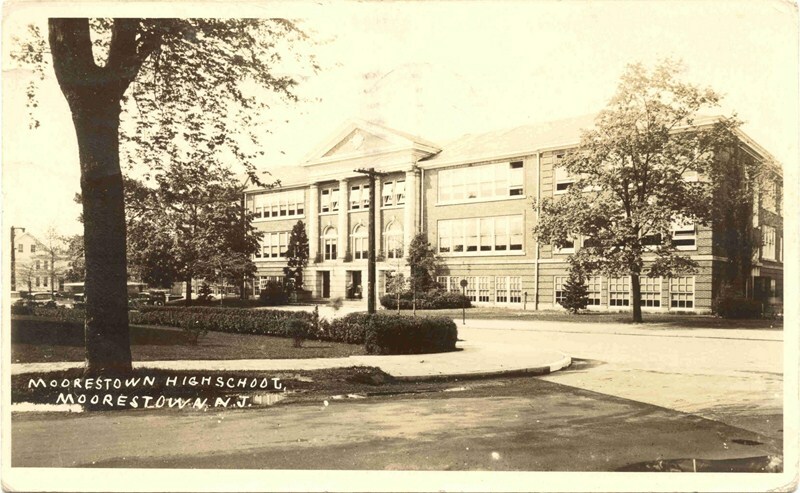 Figure 16: a picture post card mailed by the Moorestown Community House to solicit donations, postmarked MAY 21, 1951. The printed message reads, “Look familiar? Of course! It’s the Community House – the warm and friendly heart of Moorestown. It’s done a lot for you and your family. Now it needs your help. Give generously to the Community House Restoration Fund – May 19 to June 1.” Signed, “Your Community House.” Compare the ivy growth in this and the next image. Figure 17: this photo view post card postmarked AUG 4, 1953 attests to the ivy’s advance up the brickwork. Figure 18: The Trustees and Staff of the Community House thanked a patron for her gift and generous support with this postcard mailed JUL 12, 1995, using a Margaret Ingersoll pen and ink sketch of the Community House. Figure 19: Freelance artist Margaret Ingersoll also made this color rendition used on writing stationery dated 1994, which features the Community House handsome landscaping and greenery. A Past President of the Historical Society Moorestown and Moorestown’s 2003 Citizen of the Year, Midge Ingersoll is a relentless historic presevationist. Figure 20: On APR 28, 1998 the Trustees and Staff of the Community House mailed this 1996 copyright full-color contemporary post card to thank a loyal patron once again for her donation and generous support. The Moorestown Community House, is and has been part of the lives of so many people and groups over all the years! Thanks to quick action on the part of firefighters that November night the Moorestown Community House will continue to do so as it supports more than 70 community organizations. To make a contribution to its restoration, visit ourcommunityhouse.com. Did this photo essay spark a memory for you? Let us hear from you! Fig. 22: Snapped c.2005. Shown here is a delightful mid-summer view of the Community House with the prominent signage in front featuring the following organizations: The Tender, Inc – Social Daycare for the Elderly; Visiting Nurse Association; Big Brothers/Big Sisters; and Samaritan Hospice. Fig. 23: MCH front entrance. Notice there is no ivy climbing the brick face surrounding the main doorway. The years have shown how shrewd Mr. Johnson was in insisting on a low-maintenance brick exterior. Fig. 24: Close-up view of the front entrance of this classic building. Fig. 25: We see the north-side entrances to both the Community House kitchen (via the upper level stairway) and the swimming pool/locker rooms (via the lower level stairwell) here. The ever-popular corner Woman’s Club room and windows jut out with the peaked roof to the right. A bicycle rack is in the foreground. March 5, 2016 at 4:02 pm, Comment shared from Paul W. Schopp: While I have memories of being in the Community House for various functions, I thought folks would be interested in a unique story that I heard first-hand back in the early 1980s. At the time, I resided in a high-rise apartment building in the Westmont section of Haddon Township. Across the hall lived an elderly man named Russell Colgan who had recently lost his wife. Russell had served for many years as a police officer on the Delaware River/Benjamin Franklin Bridge. As a young man, however, he worked for his father, Charles Colgan, a master bricklayer from Southwest Philadelphia. When Moorestown Township contracted to have the Community House constructed, Charles Colgan received the contract and Russell regaled me with his memories of working on the building. Many folks celebrate Eldridge Johnson for his philanthropy in donating the funds for the building—and rightly so—but few if any people know the name of the contractor who actually laid the brick to make the building what it remains today: a beautiful architectural celebration of all things Moorestown! Anyone who collects RPPCs, short for “real photo post cards,” knows that while they may offer some of the most unusual and rare views, we often come up empty-handed at the end of bidding. 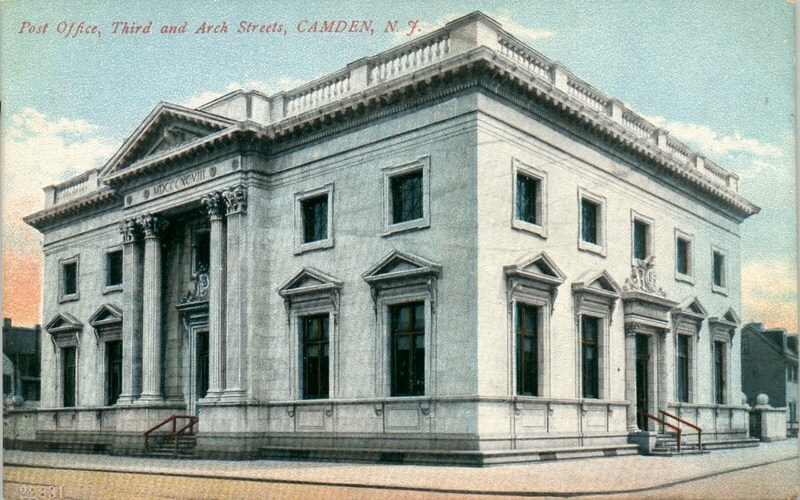 So it is with special gratitude to our friend of the HSR, Harlan Radford, we offer these scans of Camden postcards along with his annotations. We also acknowledge the contribution of historian Paul W. Schopp for his expertise and advice which resulted in this expanded commentary.Click on images for enlarged views. 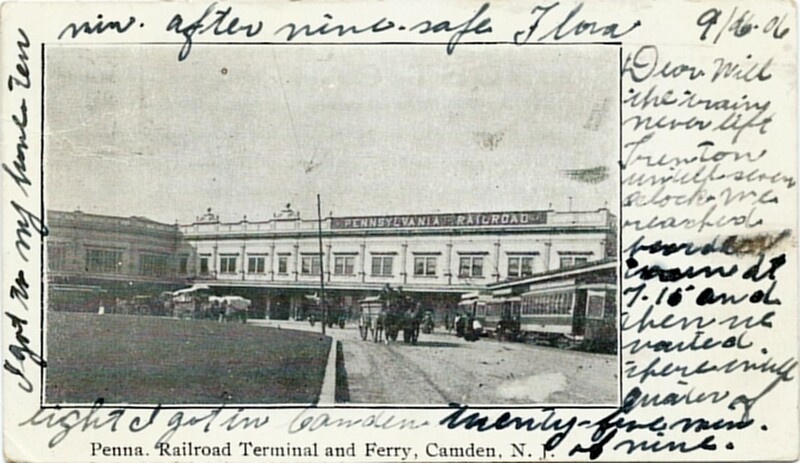 CAMDEN, NJ RPPC #10 1909: This 1909 unmailed real photo post card depicts the Pennsylvania Railroad Terminal at Federal and Market Streets in downtown Camden. Built in 1899, it consists of an overhead covered train shed enclosing all railroad tracks, two Public Service Electric Railway (trolley) loops, and four ferry-boat slips to connect with Philadelphia on the other side of the Delaware River. The prominent structure in the lower right foreground is the West Jersey Hotel. Constructed in 1850, and designed by Walt Whitman’s next-door neighbor, Stephen Decatur Button and his brother-in-law, Joseph C. Hoxie, it survived into the twentieth century, becoming the Hotel Ridgway. 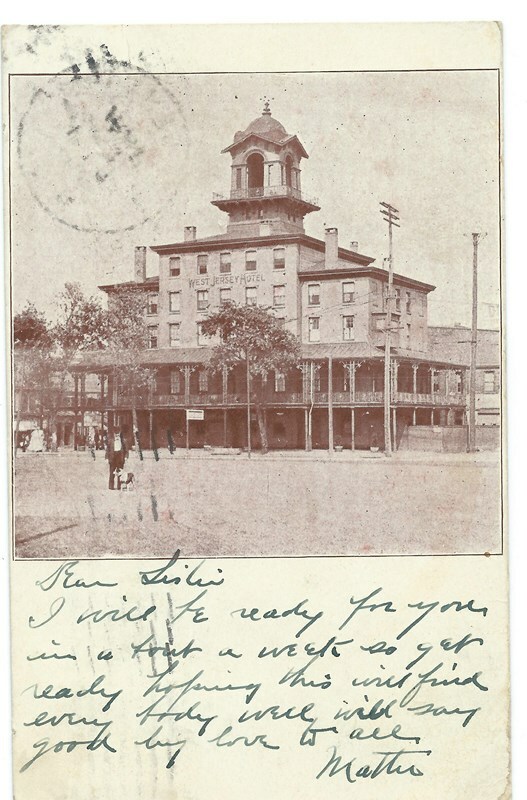 This is one of a series of 11 postcards captured by Medford post card photographer William B. Cooper from the top of the Victor Talking Machine Company’s smokestack in the summer or fall of 1908 and copyrighted in 1909. CAMDEN, NJ RPPC #5 1909: This real photo post card, copyright 1909, postmarked Feb. 26, 1909, looks towards Coopers Point, the site of the Camden & Atlantic Railroad’s ferry and train terminal and numerous shipyards. Close examination reveals a neighborhood with row houses, small businesses, and churches. Sailing ships with three, four, and six masts anchored on the Delaware River wait to receive or discharge cargo. Toward the center left of the image is an Italianate house known as Cooper’s Folly, which was unceremoniously razed in 1924. CAMDEN, NJ RPPC #6 1909: For this real photo post card view, copyright 1909, mailed and postmarked at Camden on Feb. 15, 1909, Cooper swung the camera a little bit more east from view #5, showing more of North Camden. It illustrates part of East Camden, N.J. and looking northeast to Cramer Hill. The church spire on the right is the First Presbyterian Church at 5th and Penn Streets. Cramer Hill was one of Camden’s several up and coming housing developments. Builder Alfred Cramer was known for his construction of single-family dwellings, stores, as well as tidy brick row houses, which were more affordable for Camden’s growing workforce. In the background towards the left is the Camden Woolen Mills, completed in 1866. 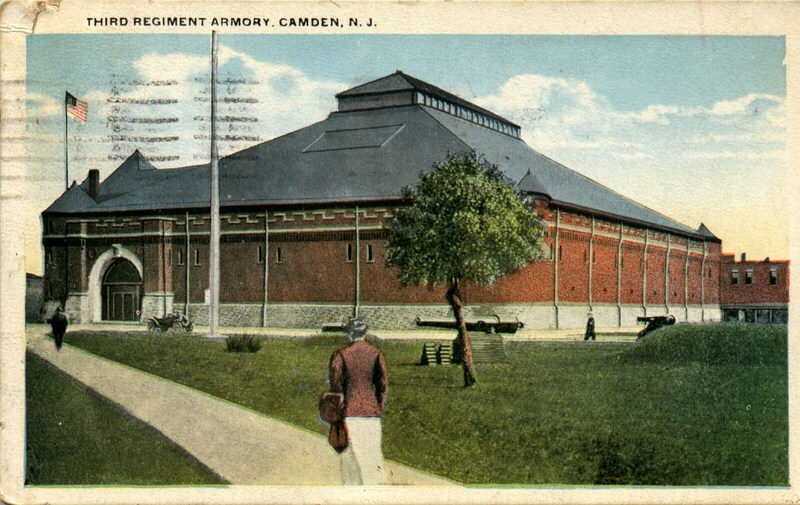 CAMDEN, NJ RPPC #11 1909: Another in the remarkable series of W.B. Cooper aerial views of Camden, this unmailed real photo post card view shows a part of downtown Camden, N.J. This image looks north/northwest toward Cooper’s Point Ferry with a Campbell Soup warehouse and various factories in the foreground and the Delaware River in the background. This sweeping outlook includes several sailing ships, many businesses, factories, warehouses, and wharves. 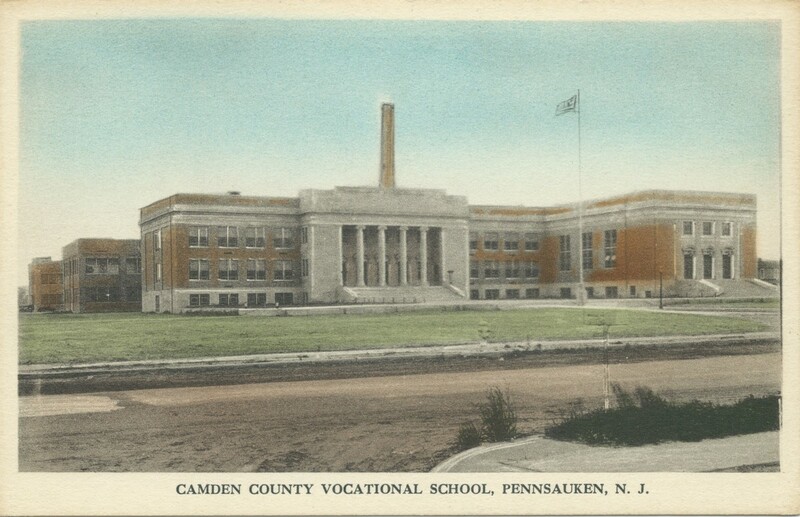 Many large and noted manufacturing companies began to call Camden their home at this time. These panoramic aerial photos give unobstructed views of the then-thriving City of Camden from several directions. RPPC CAMDEN CARNIVAL RPPC 1908: The subject of this real photo post card is a Camden Carnival on a residential street occurring Sept. 29, 1908. 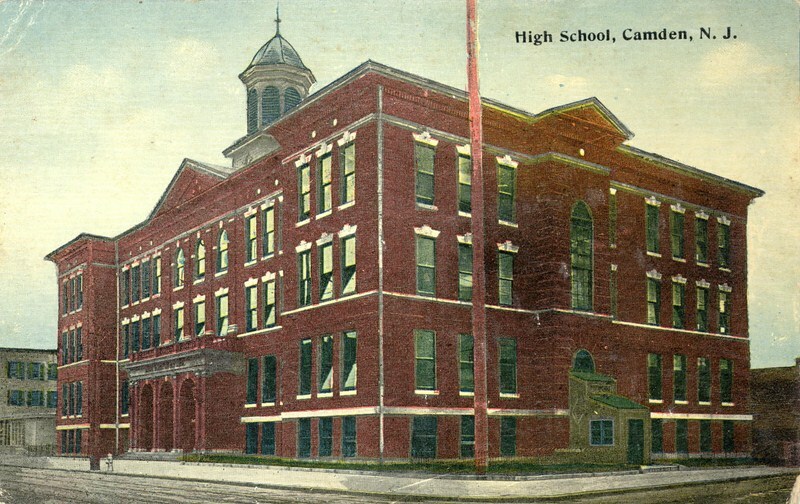 Sponsored by the Camden Business Improvement Association, the four-day celebration was held September 29, 30, and October 1, 1908. The decorated 3-horse-drawn wagon in the foreground is the center of attention. Patriotic bunting and an abundance of American flags adorn the homes. Many spectators bedecked in their finery view the parade and enjoy this celebratory occasion back in the first decade of the twentieth century! Next follow three more Camden images, and while they are already in the Camden Images Gallery, these have descriptions and are displayed in higher resolution here. CAMDEN, NJ RPPC #1 1909: Looking north from center Camden, note the dome of the North Baptist Church on the far right; Tabernacle M.E. Church is the large structure near the center; in the Delaware River in the distance lies 292-acre Petty Island (commonly called Petty’s Island). 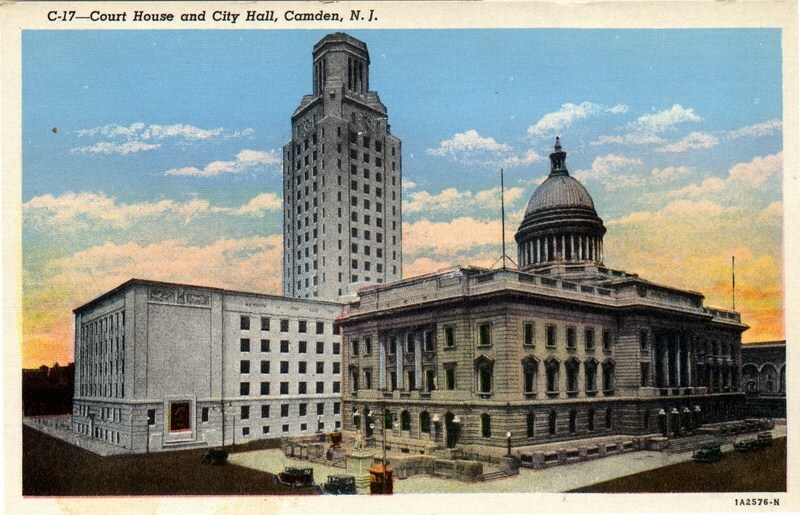 CAMDEN, NJ RPPC #8 1909: The U.S. Post Office at Third and Arch Streets, which also served as the federal courthouse, stands in the left foreground of this view of downtown Camden. Running through the center of this image is the recently completed elevated trackage of the West Jersey & Seashore’s third-rail electric line to Millville and to Atlantic City. High-speed rail at its finest! In the center right is the old Third Street Methodist Church that later became the PRR YMCA. During Walt Whitman’s time in Camden, he would frequently complain about the choir from this church! On the extreme left center, you can see the South Jersey Gas, Electric & Traction Company office building, which still stands today along Federal Street. It is a wonderful example of a Beaux Arts office building. In the distance is the steeple of First Methodist Church, which Cooper Hospital demolished within the last ten years. This image certainly captures the vitality and the steady growth that Camden experienced in the beginning of the last century. PS: Links connect to other images in the collection, although not necessarily from the same era. 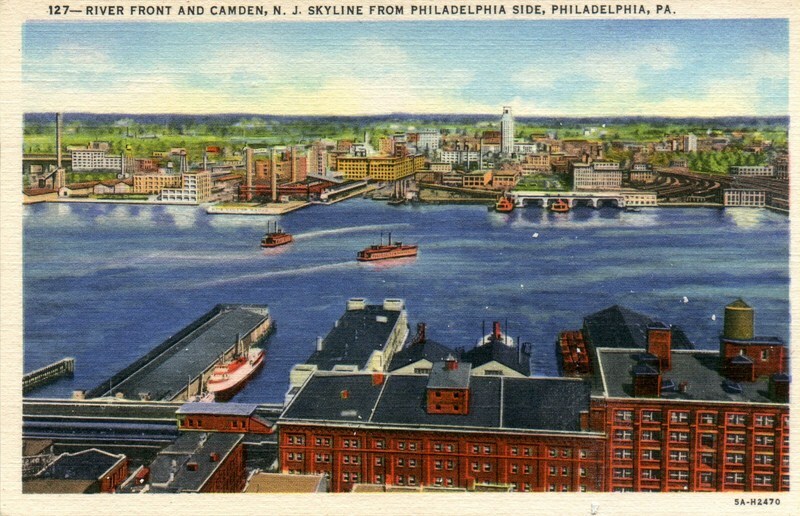 For example, the postcard showing the RCA Building also shows the Delaware River Bridge, now re-named the Benjamin Franklin Bridge, which did not open until 1926. Can you help us further to “connect the dots” by giving to the Society any scans for this or another category in our online image collection? Would not all eleven of William B. Cooper’s post cards shot from the top of the Victor Talking Machine Company’s smokestack be something to see in one place? It would be an expensive and time-consuming task for an individual, but certainly an achievable goal if others viewing this can contribute. A friend recently showed me some 1960s-era postcards he bought from a boardwalk vendor just a few years ago. Excited to see reminders of his childhood Wildwood Days, Jack bought up all eight of the old chrome postcards the seller had. The picture postcards reminded him of many sweet memories from family vacations spent at the Wildwoods. There was the Pirate Ship and the pier with all the other great rides he remembered – like the Hell Hole. Once inside the barrel-like room, it spun around with enough centrifugal force to pin you in place against its wall. Jack confessed to upchucking as he left the Hell Hole ride when he was about 8 or 9. The images didn’t quite fit the stereotypical view of the “vintage” postcards we usually display here, but then I did the math. A postcard from 1963 or 1964 is already fifty years old. That qualifies as an antique in automobile circles. I guess we’ll just have to adjust our view of what is vintage. Whatever your age, see the rest of Jack’s 1960s-era postcards plus many more from earlier times on our CAPE MAY & WILDWOOD IMAGES page.